There are three different digital maps of Forest Lodge and Glebe in the late 1880s. The most commonly used are the two on the City of Sydney’s on-line Historical Atlas of Sydney. The first of these is glebe-camperdown-newtown-macdonaldtown-darlington-1886. This map covers a large area, but it is quite detailed and easy to read. It shows building footprints but not outbuildings. Some infrastructure, including the tramway reservation on the current Minogue Cres, is included. The second of the maps on the City of Sydney site is Glebe 1888. This map is difficult to read in places but it has some advantages. The major one is that it gives the names of businesses operating at some premises. It shows building footprints but, like the 1886 map, it does not include outbuildings. The third of the digital maps from this period is actually a set of 33 separate maps each covering a small section of Glebe or Forest Lodge for 1889-90, held by The State Library of NSW. They are part of a bigger series catalogued under the title City of Sydney Survey Section.1 These maps show property boundaries, building and outbuilding footprints, sewerage and drainage infrastructure and other infrastructure. There is a separate master map series (Glebe and Forest Lodge are spread over 4 of these master maps), from which you may be able to identify the exact map you need. These City of Sydney Survey Section maps seem to have been relatively little used in research on Glebe and Forest Lodge. Some researchers have used the hard copy version, but the on-line version is seldom cited. This is surprising because the provenance of these maps gives good reason to expect they would be the most complete and accurate maps available for the period. Specifically, these maps were drawn up by the Surveyor General’s Office as part of a major NSW government infrastructure project. From 1842, water and sewerage had mostly been the responsibility of municipal governments, but by the 1870s Sydney’s water shortages and growing public health problems attested to the gross inadequacy of this arrangement.2 From 1879 the NSW government began to intervene, ultimately undertaking a massive construction programme to bring fresh Nepean water to Sydney, and to create a network of mains, deep sub-mains, pumping stations and vents to take the city’s waste to ocean outfalls.3 The first stage of the Nepean scheme was completed in 1888 and the first of the ocean outfalls was completed in 1889. The next step was to build the connecting networks. It was in this context that the Board of Water Supply and Sewerage was created to manage the network and the City of Sydney Survey Section maps were drawn up by the Surveyor General. 1. Department of Lands (Survey Branch, Surveyor General’s Office), Çity of Sydney survey section, State Library of New South Wales, No. Z/ M Ser 4 811.17/1. The digital version can be accessed through the new catalogue using the link above. Note that the series can also be found under the alternative titles of Sydney Metropolitan detail series and Metropolitan details series. In common parlance, these maps are often called ‘water board maps’ but since they cannot be located in the SLNSW catalogue under that title, nor by searching for the Board of Water Supply and Sewerage or its successors as author or series title, they have not been referred to as ‘water board maps’ here. Subsequent maps to 1945 are held by the State Archives and Records Office. 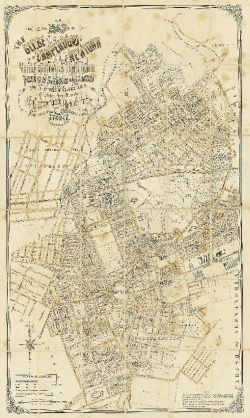 These maps have not been digitalised but the hard copy locations can be found at https://www.records.nsw.gov.au/archives/collections-and-research/guides-and-indexes/metropolitan-water-sewerage-drainage-board. Note that this link to the Metropolitan Water Sewerage and Drainage Board also includes maps from 1904 to 1925, when the responsible agency was the Metropolitan Board of Water Supply and Sewerage. 2. See Shirley Fitzgerald, Rising Damp: Sydney 1879-90, Melbourne, 1987 (especially Chapter 3), and A. J. C. Mayne, Squalor and Vice, St Lucia, 1982. 3. Prior to 1889, the City Council was responsible for piped water to the whole city. Supply mains seem to have been extended to the most densely settled areas by the 1880s, but continuity of water supply was a major problem. The NSW government finally took decisive action, passing an appropriation bill to fund the Upper Nepean scheme in 1879. This was a costly and challenging project requiring the construction of the Prospect Dam and suburban reservoirs, as well as connecting canals, main pipelines and pumping stations. When water shortages became acute in the mid-1880s, a temporary scheme was put in place to bring Nepean water to Sydney in 1886, and the first stage of the scheme proper was completed in 1888 (See W.V Aird, The Water Supply, Sewerage and Drainage of Sydney, Sydney, 1961, pp. 15-19). The NSW government also began work on sewerage infrastructure in 1880, but in this case it was prompted by the need to provide city-wide access to a sewerage network and the need to move waste away from the densely settled harbour area. The City Council had constructed city sewers which drained into the harbour from the 1850s; Darlington, Paddington and Redfern councils did likewise in the 1880s, but together the four council areas’ sewerage systems served less than 25,000 premises by 1889 (Ibid, pp. 128-34). Glebe Municipal Council also constructed a sewer line running down to Blackwattle Bay in the late 1880s accounting for another 200 connections (see Max Solling, Grandeur and Grit. Sydney, 2007, pp. 92-3). These early sewer lines were shallow and accessible only to houses on the fall line to a watercourse or discharge point. The NSW government’s new sewerage system included the construction of a network of deeper sub-mains and pumping stations so that all premises could be connected, as well as constructing the mains and ocean outfalls to dispose of the waste.